Autumn is well and truly here and I'm so happy because it's my favourite season. I love all the warm and deep colours that surround this time of the year. For some reason during the autumn and winter seasons I love to jazz up my outfits by pairing lots of accessories. I have therefore put together a bunch of fashion accessories that I am lusting over and are screaming fall time. 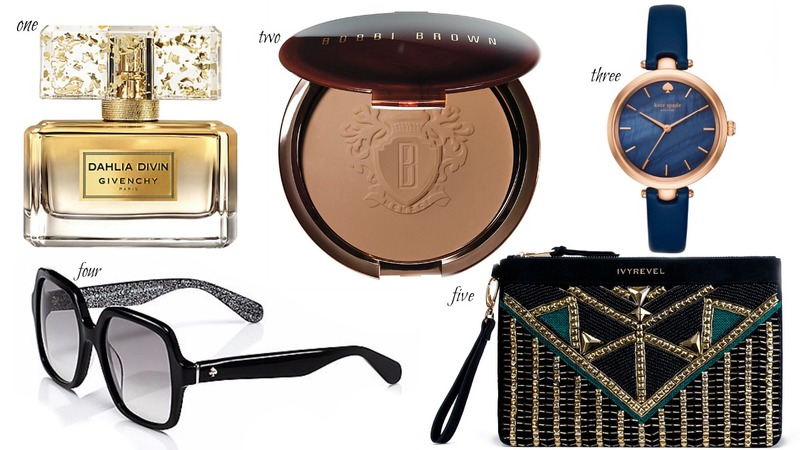 I am a total bronzer junkie so it is no surprise that I'm lusting over this Bobbi Brown one. It is just so exquisite with the antique brown packaging and the engraved logo inside the powder. This is a makeup piece in NEED in my life! Now, although Autumn is usually quite cold with frosty and misty days, the sun is usually quite low in the sky and can be just as strong as the summer months. Therefore I'm awing over these Kate Spade sunglasses. They have the right amount of sophistication as well as glam. Okay, so lets just take a minute to appreciate the exquisite perfume bottle by Givenchy! This is the new Dahlia Divin Le Nectar scent. If you haven't smelled any of the Dahlia Divin range then you must ASAP! This is quite a woody scent with orange essence. It is soooo beautiful, I just can't deal! Hope you're loving Autumn as much as I am right now!